A change in pharmacokinetics can alter drug exposure and predispose the patient to either over- or underdosing, potentially resulting in adverse drug reactions or therapeutic failure. Kidney disease is characterized by multiple physiologic effects, which induce clinically significant changes in pharmacokinetics. These vary between individuals and may be quantitated in certain instances. An understanding of pharmacokinetic concepts is, therefore, important for a rational approach to the design of drug dosing regimens for the delivery of personalized medical care. Whether kidney disease is acute or chronic, drug clearance decreases and the volume of distribution may remain unchanged or increase. AKI is defined by dynamic changes in kidney function, which complicates attempts to accurately quantify drug clearance. In contrast, changes in drug clearance progress more slowly with CKD. In general, kidney replacement therapies increase drug clearance, but the extent to which this occurs depends on the modality used and its duration, the drug’s properties, and the timing of drug administration. However, the changes in drug handling associated with kidney disease are not isolated to reduced kidney clearance and an appreciation of the scale of potential derangements is important. In most instances, the first dose administered in patients with kidney disease is the same as in patients with normal kidney function. However, in some cases, a higher (loading) initial dose is given to rapidly achieve therapeutic concentrations, followed by a lower maintenance dose, as is well described when prescribing anti-infectives to patients with sepsis and AKI. This review provides an overview of how pharmacokinetic principles can be applied to patients with kidney disease to personalize dosage regimens. Patients with kidney disease are a vulnerable population and the increasing prevalence of kidney disease means that these considerations are important for all prescribers. Pharmacokinetic concepts underlie the rational prescribing of drugs. Drugs are commonly prescribed in the management of patients with both chronic and acute kidney disease, and this population may have an increased risk of adverse drug reactions (1). Kidney diseases cause a range of changes to pharmacokinetics, as discussed in part 1 of this series (2), so these must be considered when designing appropriate dosage regimens. The usual method of dosage adjustment in patients with kidney disease is defined by the product label, but this can have limitations. During drug development, dosing regimens are initially determined in patients with normal or mildly impaired kidney function. The drugs are then trialed in a smaller number of patients with more severe kidney disease before registration. Data for patients with ESKD treated with dialysis are particularly limited before registration, with only a minority of new drug applications to the US Food and Drug Administration (FDA) being evaluated in this patient population (3). Indeed, because of complex pharmacokinetics in a small number of cases or other safety concerns, manufacturers may recommend that the drug is contraindicated in patients with advanced kidney disease, hindering access to a potentially beneficial drug. As discussed in part 1 (2), although there are guidelines available for dosage adjustment in patients with kidney disease, these guidelines may be inconsistent (4) or not applicable to all clinical contexts, particularly in AKI where drug clearance can change rapidly. A common approach to drug dosing when there is uncertainty in its dosage or pharmacokinetics in patients with kidney disease is to use a conservative “start low and go slow” iterative approach. Depending on the rate of dose escalation, this approach will attain a target clinical effect (e.g., BP or glycosylated hemoglobin A1c) in a delayed fashion, which is reasonable for drugs that yield a clinical benefit from treatment over months or years (e.g., antihypertensives or oral hypoglycemics). However, this approach is less useful for drugs requiring a rapid onset of effect, such as anti-infective or immunosuppressive drugs. Antibiotics are inappropriately dosed in patients with decreased GFR, and this may contribute to poorer outcomes in those requiring kidney replacement therapy (5,6). The purpose of this review is to provide an overview of how the pharmacokinetic principles outlined in part 1 of this series (2) can be applied to patients with kidney disease to personalize dosage regimens and to appropriately monitor drug therapy. It should, therefore, be possible to optimize drug therapy in this vulnerable patient population, utilizing this knowledge both at the bedside and when designing research projects. The important principles to consider include the therapeutic target, the initial dose, the maintenance dose, the dose frequency, and when a dosage adjustment should be performed. The key changes in pharmacokinetics that occur in a patient with kidney disease have been discussed elsewhere (2). These principles require the prescriber to obtain published pharmacokinetic data from patient populations with similar causes of kidney disease, its severity, and manifestations, to the patient receiving treatment. Appropriate data are often difficult to ascertain, and assumptions are commonly required to assess their clinical applicability. Furthermore, interpatient pharmacokinetic variability exists, present even in apparently homogenous patient populations. This is further complicated in a cohort of patients with CKD, which incorporates a heterogeneous mix of etiologies. So, although the methods described below appear somewhat precise, there are substantial and unpredictable errors within the calculations that warrant close monitoring. Fortunately, many of the drugs currently used have a good safety profile, and therapeutic drug monitoring (TDM) is (or should be) performed for drugs requiring more precision. Prescribing a dose that maximizes benefits and minimizes risks is the goal of rational drug dosing. Serum drug concentration targets are derived from concentration–efficacy and/or concentration–toxicity relationships and may reflect a therapeutic target or the avoidance of drug accumulation and adverse events (Figure 1). The specific therapeutic target (optimal plasma concentration range) depends on the drug being prescribed, and sometimes on the indication and individual being treated and the intended duration of therapy. In many instances, it is possible to measure not only the pharmacokinetic outcomes but also the desired therapeutic outcomes in both the short- and long-term. For example, changes to an antidiabetic regimen can be readily measured by monitoring plasma glucose concentration, as well as a long-term assessment of the effect on hemoglobin A1c. The same daily dose of metformin administered as different dosage regimens has differing effects on the concentration–time profile in a patient with CKD. Three different dosage regimens (each equivalent to 1000 mg/d) are simulated in a patient with an GFR of 20 ml/min. The concentration–time profiles are shown relative to a proposed target concentration of 2–3 mg/L. This dosage is anticipated to be an overdose on the basis of a suggested initial dose of 750 mg/d for patients with an GFR of 30 ml/min (42). Each regimen achieves steady-state concentrations within 70 hours and the same average plasma concentration, but more frequent dosing is associated with less variability in plasma concentration (the difference between Cmax and the minimum plasma concentration). Some drugs, such as anti-infectives, immunosuppressants, and chemotherapy, are prescribed to maximize the effect of the initial dose, although the full therapeutic benefit may not be observed for days, weeks, or even months. Antibiotics also need to target a concentration–time profile related to the markers of bacterial susceptibility, such as the minimum inhibitory concentration. For other drugs, a reasonable starting point is to prescribe a dosage regimen that will target the mean or median drug concentration that was demonstrated to be effective in clinical trials. These and other examples are discussed in more detail in part 1 of this series (2). Pharmacokinetics is a quantitative science, meaning that each parameter can be measured. These data can be incorporated into relatively simple equations to determine a dosing regimen. A loading dose decreases the time to achieve the target concentration. When the plasma t1/2 is prolonged (for example, because of kidney disease), the time to reach steady state or the target concentration increases proportionally. Administration of a loading dose reduces the time to achieve the therapeutic plasma concentration, and in this simulation the loading dose is double the maintenance dose. (Equation 2)A potential complexity with Equation 2 is determining drug clearance in an individual patient at the time of prescribing, which is discussed in part 1 (2) and below for each patient group. (Equation 3)A decrease in drug clearance with kidney disease prompts a decrease in either the maintenance dose or an increase in the dosing interval (Equations 2 and 3). The dosing frequency depends on the toxicity profile of the drug. For example, a relatively long dosing interval will require a relatively high Cmax to maintain an acceptable mean drug concentration (Figure 1). Therefore, in most instances, a reduction in dose rather than an increase in the dosing interval is appropriate, with the uncommon exception of drugs where high peak serum concentrations are beneficial, such as ciprofloxacin. As the decrease in clearance also prolongs the elimination t1/2 (Equation 4 from part 1 ), the time until achieving steady state (achieved after 3–5 times the t1/2) is delayed compared with patients with normal kidney function (Figure 3). An increase in a drug’s t1/2 prolongs the time to achieve steady-state plasma concentrations with maintenance dosing. The effect of the same dose given to three simulated patients with CKD. The increasing elimination t1/2 are because of decreasing endogenous clearance, which is noted with increasing severity of CKD. Increasing the t1/2 delays the time to steady-state plasma concentrations and results in higher plasma concentrations. Failure to reduce the dose or frequency in patients with the longer t1/2 may predispose to adverse drug reactions. # indicates the time when steady-state conditions are achieved for the respective profile. These conditions are present when the concentration–time profile plateaus, for example, when the Cmax (maximum plasma concentrations) are no longer increasing. Kidney disease encompasses a heterogeneous range of conditions of differing severity, but also differing effects on the kidney vasculature, glomeruli, and tubulointerstitium. Each condition and corresponding treatment(s) have the potential to exert different effects on a drug’s pharmacokinetics. Criteria that indicate the potential for a clinically significant decrease in kidney function due to either AKI or CKD were proposed by the Extracorporeal Treatments in Poisoning (known as EXTRIP) group (see Table 1). These criteria were proposed to aid bedside decision-making for the treatment of poisonings, such as lithium (7), methanol (8), and metformin (9), but the underlying considerations are similar to those for therapeutic drug dosing. It is important to note that these criteria have not been validated. CKD is a progressive decline in GFR such that kidney function is reasonably stable over weeks or months. Drug absorption from the gastrointestinal tract may be highly variable in patients with CKD. Although it is commonly thought that absorption decreases in edematous states because of gut wall edema, animal and human studies indicate that drug absorption may actually increase because of impairment of the gut wall barrier function or a decrease in function and/or expression of efflux transporters, such as P-glycoprotein (10). Furthermore, for drugs with a low bioavailability because of hepatic first-pass metabolism, the decrease in cytochrome-P (CYP) 450 enzyme and transporter activity (see part 1 ) may increase bioavailability. For example, significant increases in both the area under the concentration–time curve and Cmax have been demonstrated for both dihydrocodeine and repaglinide in patients with advanced CKD (Figure 4) (11,12). It is important to be cognizant of this phenomenon when prescribing these and other drugs. However, it is not clear how applicable these data are to other patients, so increased monitoring is required. The complexities of interpreting changes in area under the concentration–time curve and Cmax with regards to reduced clearance or increased bioavailability are discussed in part 1 of this series (2). Dose adjustments in patients with CKD are based on the change in the concentration-time profile for the drug of interest. Compared with patients with no kidney disease, those with advanced CKD receiving oral dihydrocodeine (upper panel; substrate of CYP2D6 and CYP3A4) showed a decrease in clearance and an increase in the mean area under the concentration–time curve and Cmax of 70% and 29%, respectively. To achieve concentrations similar to those in patients without kidney disease, the dosing interval should be prolonged but the dose does not need to be changed. In contrast, for oral repaglinide (lower panel; substrate of CYP3A4, CYP2C8, and organic anion transporting polypeptide OATP1B1, in patients with advanced CKD the mean area under the concentration–time curve and Cmax increase 232% and 82%, respectively compared with patients with no kidney disease. Here, to achieve plasma concentrations similar to those in patients without kidney disease, both the dosing interval should be prolonged and a lower dose should be prescribed. Figure panels are approximate representations of data published by Barnes et al. (11) and Marbury et al. (12). An expansion in Vd is reported with advanced CKD because of subsequent fluid retention, hypoalbuminemia, and decreased protein binding. However, Vd may also decrease in the context of sarcopenia, which is more common with advanced CKD. Overall, the change in Vd from interdialytic weight gain is low relative to total body water and is not clinically significant. The effect of severe edema on Vd is inconsistent, with studies finding that Vd could either double (13) or remain unchanged (14) in the setting of marked extracellular fluid expansion. Fluid overload is more likely to affect the Vd of hydrophilic drugs (for example, aminoglycoside, β-lactam, and glycopeptide antibiotics) compared with lipophilic drugs, but these rules are not always applicable. The decrease in GFR with CKD decreases kidney drug clearance. A practical approach to adjusting drug doses in CKD is to assume that kidney drug clearance will decrease in proportion to GFR, and that nonkidney clearance is unchanged (see Figure 2 in part 1 ). However, this otherwise convenient approach is limited by changes to nonkidney clearance that occur with kidney disease and are difficult to quantify at the individual level (2). It also ignores the role of intact kidney tubules in the handling of many drugs and that tubular elimination likely increases relative to glomerular clearance in some types of kidney disease. For example, kidney clearance is 25% lower in patients with CKD involving tubular dysfunction relative to those with isolated GN (15). In patients with GN, proteinuria, and hypoalbuminemia but creatinine clearance (CrCL) >90 ml/min, apparent clearance of fexofenadine (substrate of P-glycoprotein and other transporters) is decreased 40% compared with healthy controls with a comparable GFR (16). Further, the elimination t1/2 of fexofenadine is prolonged in patients with GN compared with patients with ESKD and healthy controls, suggesting an increased Vd with GN (16). Yet, flurbiprofen (CYP2C9 substrate) had similar pharmacokinetics in patients with GN and CrCL>90 ml/min as in patients with ESKD. Rosiglitazone clearance is increased three-fold in patients with FSGS and nephrotic-range proteinuria despite normal eGFR, compared with healthy controls (17). Therefore, it is not possible to generalize these findings of altered pharmacokinetics to patients with different GFRs, kidney diseases, or other drugs, but the general principles are summarized in Tables 2 and 3. AKI commonly occurs in critically ill patients. Here, dosage adjustments are complicated because of multiple marked and dynamic changes in physiology, including organ dysfunction and volume status. Subsequently, drug concentrations can either increase or decrease if the dose is not properly adjusted. For example, AKI is a common consequence of bacterial sepsis and a substantial proportion of critically ill patients receive inadequate antibiotic concentrations within the critical first 48 hours of treatment (18,19). Although some drugs used for chronic conditions can be withheld in the context of AKI (20), others such as anticoagulants, immunosuppressants, antihyperglycemics, and analgesics are often continued. In each case, dosage adjustment is required to limit the risk of adverse effects without compromising efficacy. The Vd often increases in AKI; for example, in critically ill patients with sepsis and AKI, antibiotic Vd varies ten-fold or more (21). This occurs because of intravenous fluid loading during resuscitation, vasoplegia, and capillary leak causing edema, pleural effusions, or ascites, as well as changes in protein binding (22). The RIFLE (Risk, Injury, Failure, Loss, ESKD) and AKIN (AKI Network) criteria categorize AKI severity on the basis of the increase in plasma creatinine concentration or decrease in urine output, but they do not quantify GFR. Changes in creatinine lag behind those of GFR (23), and intravenous fluids and dialysis temporarily decrease the plasma creatinine concentration, understating the severity of AKI. Alternatives methods to quantitate changes in kidney function in AKI include an abbreviated CrCL in patients without anuria over 2–12 hours (24), or measuring GFR using an exogenous compound; however, these only determine kidney function at a single time point. The rate of increase in creatinine plasma concentration is a further alternative (25,26), but is uncommonly used. AKI decreases kidney drug clearance, which prompts a reduction in the maintenance dose (Equations 2 and 3). Unfortunately, the principles discussed for CKD cannot be readily applied to AKI because drug clearance (and distribution) vary widely in short time frames (over hours or days) and it is difficult to practically quantify GFR (21,22). Wide interpatient pharmacokinetic variability also means that extrapolation from other studies is not always possible. For example, in patients with sepsis treated with moxifloxacin, the mean clearance and Vd were similar to healthy patients, but interpatient variability in clearance (up to 60%) and Vd (30%) was greater in patients with sepsis (27). Furthermore, changes in the clearance of β-lactam antibiotics correlate poorly with fluctuations in CrCL (28). Thus, TDM is the best way to ensure the attainment of pharmacokinetic targets in AKI. There are limited data about the effect of AKI on nonkidney clearance, but the clearance of midazolam (CYP3A4/5 substrate) is noted to decrease in AKI, suggesting that CYP450 and other nonkidney processes may also be impaired (29,30). Changes in bowel, hepatic, and kidney perfusion with critical illness may also alter drug absorption and disposition. Ultimately, the high interpatient variability in pharmacokinetics with AKI is a significant challenge and complicates attempts to provide a generic approach to drug dosing. Because an increase in Vd is commonly noted, the initial dose should be increased if a prompt response is desired, particularly for hydrophilic antibiotics (e.g., penicillins). These principles are summarized in Tables 2 and 3. More research is required to guide repeat dosing, especially for drugs that are subject to nonkidney clearance or those with a narrow therapeutic index, for which TDM is particularly useful. Drug clearance by kidney replacement therapies is additive to endogenous clearance (see Equation 2 in part 1 ), so it should be accounted for in determining the appropriate dosing regimen. Unfortunately, a complexity with doing so is that data concerning the effect of dialysis on drug clearance is often highly variable or simply not available. Limitations relate to advances in dialysis technology (data published decades ago are of questionable present-day relevance), the use of inadequate pharmacokinetic methods, or differences in the dialysis regimen used between published studies and local practice (blood and dialysate flow, filter size and type, etc. ; Table 4) (31). In some cases, it may be possible to estimate drug clearance on the basis of the clearance of endogenous molecules, such as urea (a small molecule) or β2-microglobulin (a medium-sized molecule) from experimental studies. Fortunately, it is possible to manage the effect of intermittent hemodialysis on the drug regimen by administering drugs relative to the timing of hemodialysis. Although high clearances are reported (even exceeding 200 ml/min, which far exceeds endogenous clearance of many drugs eliminated by the kidney), hemodialysis is of a relatively short duration. Therefore, the practical approach is to administer drugs that are cleared during dialysis after the dialysis treatment and to tolerate low concentrations during dialysis. If subtherapeutic concentrations during dialysis are not tolerated, then a small additional dose (calculated using Equation 1) can be given midway through dialysis. However, for patients where dialysis is removing uremic toxins that interfere with nonkidney clearance (see discussion in part 1 of this series ), there may be an increase in drug clearance soon after dialysis that is nonsustained during the interdialytic period. These principles are summarized in Tables 2 and 3. 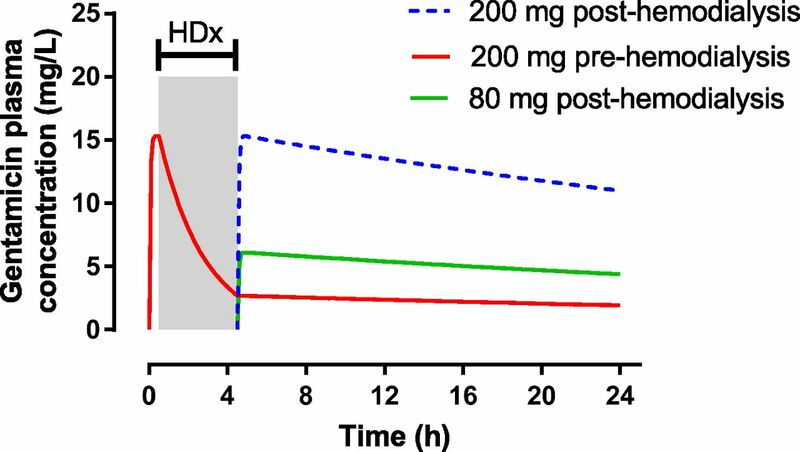 One possible exception to this approach is the prescribing of aminoglycosides to patients with ESKD on intermittent hemodialysis, where a large dose can be administered immediately before dialysis to optimize the concentration–time profile (Figure 5). The timing of gentamicin administration affects the concentration-time profile in patients using hemodialysis. Simulation on the basis of a 30-minute intravenous infusion of 200 or 80 mg gentamicin, using median values from Sowinski et al. (43) including Vd of 13.5 L, endogenous elimination t1/2 of 39.4 hours, and elimination t1/2 during hemodialysis (HDx) of 1.6 hours. Administration prehemodialysis maximizes the Cmax:MIC ratio (ratio of Cmax to the minimum inhibitory concentration of the bacteria; see part 1 ) and decreases the overall exposure. This demonstrates that a large dose can be administered immediately predialysis to take advantage of the concentration-dependent killing and postantibiotic effect of this antibiotic class. This maximizes the antibiotic concentration–time profile and drug effect, and the clearance achieved by dialysis allows for the aminoglycoside to be rapidly cleared to a less toxic concentration. Other antibiotics that also have a concentration-dependent killing and therefore may also benefit from a large dose immediately before dialysis are daptomycin (44) and the fluoroquinolones (45,46). Similar principles as outlined for intermittent hemodialysis can be applied to continuous KRT, noting that continuous KRT is applied for a longer duration. Unfortunately, there are minimal data regarding drug clearance during continuous KRT and much of it is limited to antibiotics. It is apparent (and predicted) that drug clearance by continuous KRT is less efficient than intermittent hemodialysis. However, the prolonged duration of continuous KRT means that it is more likely to remove a significant amount of the drug over the course of treatment. Reported continuous KRT clearances are quite variable given the heterogeneity of continuous KRT prescribing (blood, dialysate, and ultrafiltration rates; Table 4) and techniques used. This complicates the prediction of pharmacokinetics and individual drug dosing. Depending on the technique used, the clearance rate of small water-soluble drugs with minimal protein binding by continuous KRT is approximately 20%–30% of that from intermittent modalities. Small-molecule clearance by continuous KRT appears to most strongly correlate with the effluent flow rate (32), which is the sum of dialysis fluid, replacement fluid, and net ultrafiltration rates (see Table 4). Changes in blood flow rates affect drug and solute clearance in convective continuous KRT to a greater extent than in diffusive therapies (33) (Table 4). The effect of hybrid techniques (e.g., sustained low-efficiency dialysis or prolonged intermittent KRT) on pharmacokinetics is even less defined. It is, therefore, difficult to make precise recommendations for the prescribing of most drugs during continuous KRT. Given that continuous KRT is generally prescribed to patients with AKI for which pharmacokinetic data are already uncertain, continuous KRT compounds the variability in drug clearance. Whether continuous KRT significantly increases the total clearance also depends on the pharmacokinetics of the drugs of interest. For example, in patients with AKI receiving continuous hemodiafiltration, continuous KRT was more likely to significantly contribute to total clearance for vancomycin and meropenem, but less likely for ciprofloxacin and piperacillin (21). Given the lack of certainty, TDM remains the only reliable method of confirming attainment of target concentrations in this setting. Similar principles as those outlined for continuous KRT apply to peritoneal dialysis (PD). Although there are different techniques with differing clearances and there are minimal data regarding drug clearance during PD, its overall additional effect on total clearance is probably low. An important consideration is antibiotic dosing for PD-associated peritonitis, for which dosing recommendations are commonly made on the basis of uncontrolled observational studies using multiple antibiotics and without TDM (34). Further, some pharmacokinetic studies of intraperitoneal (IP) antibiotics were reported in patients without PD-associated peritonitis and did not report IP antibiotic concentrations or the effect of antibiotic-free PD exchanges. Therefore, it is not clear whether regimens made on the basis of these data achieve optimal antibiotic concentrations. For example, until recently either cefalothin or cefazolin were the recommended first-line empirical antibiotics and were dosed identically (35), but it is now known that cefalothin is undetectable in IP fluid and plasma for at least 12 hours with once daily IP administration (36). This is because >30% of cefalothin clearance is by nonkidney metabolism, whereas cefazolin is predominantly cleared by the kidney. This is in contrast to vancomycin and gentamicin, where dosing is guided by plasma concentration monitoring (37). Therefore, comparing outcomes solely on the basis of the type of antibiotic (38), without considering dosing regimen, may be suboptimal. The risk of sub- or supratherapeutic drug concentrations in clinical practice prompts the use of methods that confirm that the desired drug concentrations are achieved, such as TDM. Here, drug concentrations are measured in the patient and if the concentration is outside the desired therapeutic range, the dosing regimen is adjusted accordingly. Dosage adjustments may be iterative, but modifications can be improved with the above-discussed methods or computer-based approaches, including those using Bayesian methodology (39). TDM-based approaches overcome interindividual variation in pharmacokinetics and guide the delivery of individualized drug therapy. This tailored approach has advantages because much of the previously mentioned data were on the basis of population mean or median results, yet interindividual variability in results was often significant, particularly in critically ill patients. TDM should be performed routinely for anti-infectives because the concentration is the key determinant of their effect (see part 1 of this series ). TDM is now an accepted standard of care and a key indicator for the appropriateness of antibiotic use and stewardship (40). A complexity with TDM is ensuring that the appropriate plasma sample(s) are collected at the correct time. A limitation of TDM for many drugs is the slow turnaround time of assay results, such that drug concentrations are not available in a clinically useful time frame. Regardless, it is a superior method of dosage adjustment and is also useful in research when exploring the dose-response relationship, particularly in the setting of altered physiology. There are limited data to guide the prescribing of drugs in kidney impairment and widely used dosing recommendations are often made on the basis of outdated data and/or theoretical extrapolation. Despite concerns regarding the effect of sub- and supratherapeutic drug concentrations, TDM and Bayesian-style computer-based dosing are not currently performed routinely for most drugs administered to patients receiving KRT. Furthermore, physiologically-based pharmacokinetic modeling is an approach that is increasingly used to predict the effect of changes in kidney function on pharmacokinetics and to guide rational drug dosing. Data obtained from routine TDM may help inform appropriate drug dosing in this understudied patient population. The lack of data for some drugs in some circumstances is so extreme that even a single case report, with proper sample collection and drug concentration measurements, would be informative. The urgent need for further research is recognized by the FDA, who now recommend (although do not mandate) that pharmacokinetic studies are performed in patients with kidney disease for drugs that can be administered to patients with ESKD (41). For drugs already registered, smaller pilot studies can provide preliminary data to define the effect of kidney disease and dialysis on drug clearance and inform the design of future prospective studies. This will close the large gap in knowledge and ultimately assist in improving the drug prescribing and clinical outcomes in these vulnerable patients. 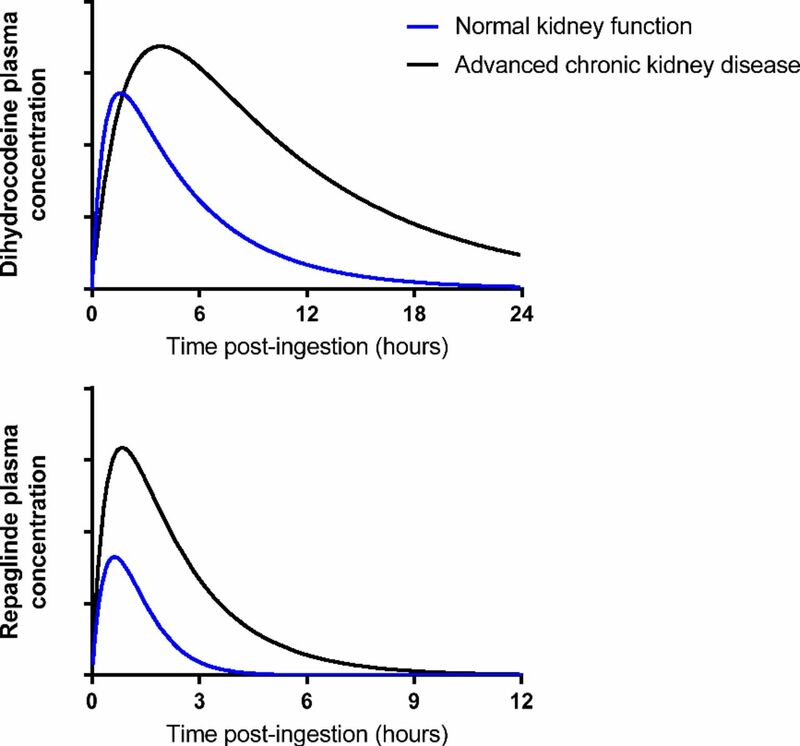 CKD and AKI are heterogeneous conditions with differing effects on pharmacokinetics, which complicates the development of generic drug dosing guidelines. Prescribing an appropriate initial dose and maintenance dosing regimen requires a rational approach and an understanding of the underlying pharmacokinetic concepts. Furthermore, the prescriber needs to be cognizant of dynamic factors that may change how a drug is handled over the treatment course. TDM on the basis of drug concentrations can assist with optimization of the dosing regimen, supporting the achievement of personalized medicine, but requires the timely availability of drug concentrations and prescribers sufficiently trained in pharmacokinetic principles. An iterative approach accounts for potentially wide inter- and intraindividual variation in pharmacokinetic parameters and the careful use of TDM to monitor the chosen dosing regimen is essential. The use of computer-based Bayesian approaches to dosing offers opportunities to tailor therapy and deliver personalized medical care; however, these are not widely used in routine clinical practice. Irrespective of how treatment is tailored to an individual patient, more pharmacokinetic data are required in all stages of CKD and AKI, including the effect of KRT, to inform drug dosing. The collection of this data are within the reach of most clinicians and hospital departments. D.M.R. is a recipient of the Jacquot Research Establishment Fellowship, Royal Australasian College of Physicians and the Clinician “Buy-Out” Program, St. Vincent’s Centre for Applied Medical Research.